Have your kids started pouring over the Holiday wish books yet? Are they circling items in sharpie or leaving “hints” around the house or on your weekly shopping list? Giftbirdy moves the wish book and holiday wish list into the 21st century. It harnesses the power of Amazon in a kid-friendly platform that’s easily updatable. Kids are able to create wish lists from Amazon’s vast inventory. With a little help, kids can sort through kid-friendly categories, and add gifts to their wish lists. Emailing the link to relatives is easy, and the wish list is updated as purchases are made. This kind of tracker will come in handy for my own nieces and nephews, who are into toys that have eleventy hundred assorted “sets”. Knowing which ones they really want, and which ones have been purchased will be really helpful this holiday season. I’m thinking Grandma may also appreciate knowing which “pink Polly Pocket” MaM is referring to when making her own requests. Visit Giftbirdy yourself, and see what the fuss is about. This welcome video will tell you everything you need to know. It takes about 2 minutes to make an account and start browsing, and when your child is done, she can stick around and play games on the site. The Funhouse is home to fun games, and while playing, kids can earn points, which can be redeemed for ‘bambinos”. Any kid into collecting is going to want to start logging in to earn those little critters. So there you have it. 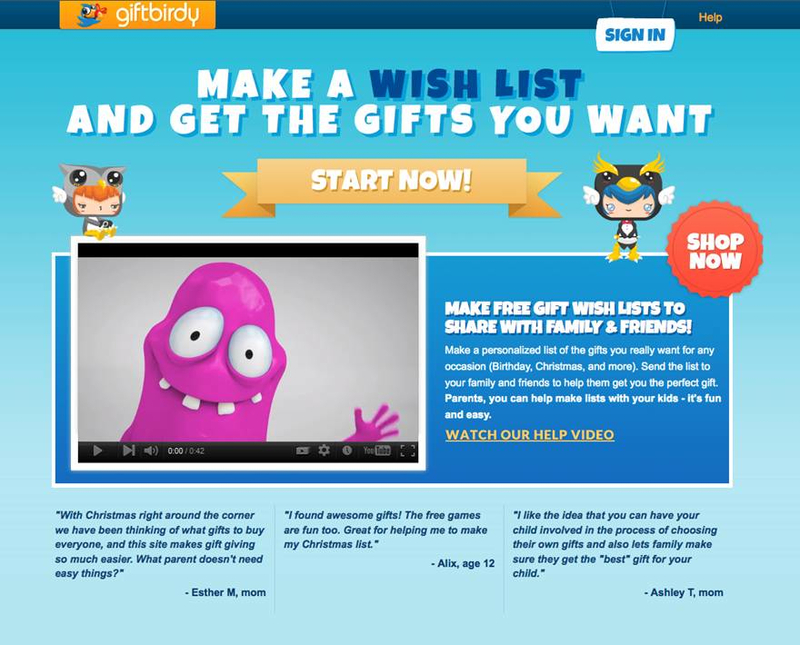 Gift Birdy is online wish list making that’s easily sharable with whatever little helpers would like to see the list. What’s not to like about that? Do you kids still spend hours dreaming with a toy catalogue? Have they tried making a wish list online before? **Disclosure: This is a sponsored post from One2One Network and Gift Birdy. All opinions stated are my own. 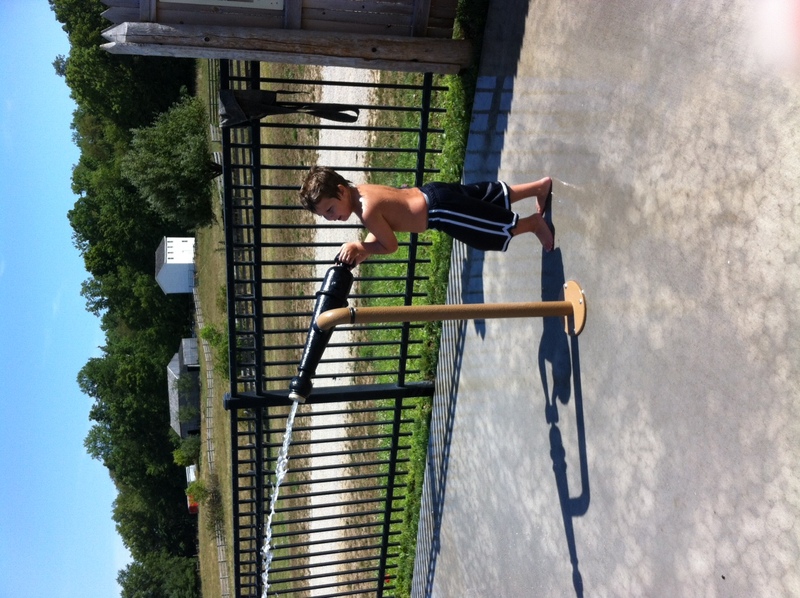 Who has time to eat when there are water cannons to shoot? 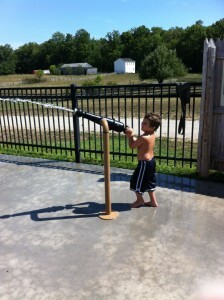 I read somewhere that we only get eighteen summers with our kids. Really, it’s a lot fewer than that- when I think of childhood summers, it’s always the years I was in elementary school. Old enough to remember, but before I started doing more things with my friends/away from home than I did with my family. This means I have *maybe* five summers left with MaM to make the bulk of those memories. I want her to remember our summer evenings outside on the patio and eating popsicles. I want her to remember evenings where we stopped swimming just long enough to eat supper, and then headed back to the pool. There is no need to spend an extra second in the kitchen when there are memories to be made. I should hang a sign on my stove: “Closed for the Season”. Once the weather heats up, I don’t do much in the kitchen. I mean, we still eat, but I moved the cooking to the grill and everything else goes in the refrigerator. I attribute my affection for grilling to my parents, who pretty much cook out all summer long. Even if it’s too hot to eat outside, grilling outside keeps the house cool. You know what else happens when I grill? There are no dishes. Most everything I grill goes directly on grill, and what doesn’t gets cooked in a tin foil pouch, because I am classy. 4. Place potatoes in a tin foil packet so that the potatoes are in a single layer. 5. Cook on a medium-hot grill for about 30 minutes, turning once. Seriously, does it get any easier than that? These potatoes are a staple on my summer dinner menu, and even MaM likes to eat them (with ketchup). You can pretty much grill any vegetable this way- squash cooks faster, carrots take a bit longer. Summer time isn’t so much about the grill for the kids though. They don’t fully appreciate grilled steaks, or any meat at this point (but for those who do, check out these Grilled T-Bones). For the kids, it’s the dessert. Specifically, desserts of the frozen persuasion. Hot summer nights get instantly cooler when I pull out the ice cream or the popsicles. We pretty much stick to frozen treats in the summer, because again, remember, my kitchen is closed. 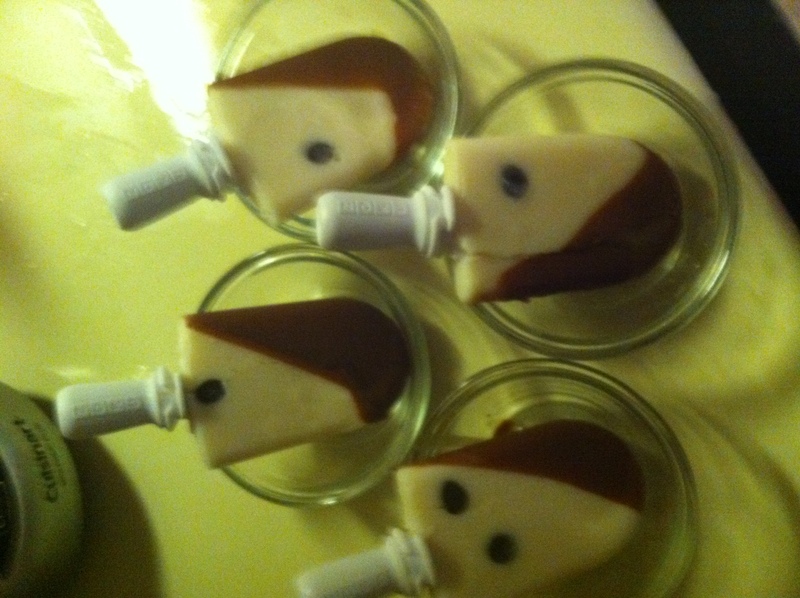 Mmm…chocolate chip pudding pops with a chocolate shell. 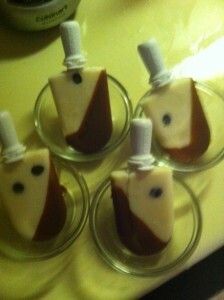 Ready to try your hand at popsicle making? Here are some recipes to get you started! 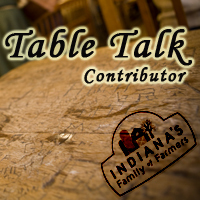 I am excited to be an Indiana Family of Farmers Table Talk Contributor. A few times a year I will write a sponsored post on a provided topic. As always, my experiences and opinions are my own. But really, have you ever met a “bad” popsicle? This past week two fun things happened– I took part in a podcast with my friends Heather Sokol and Lorraine Ball, AND I got to read an advance copy of my friend Judy Miller’s new e-book, What to Expect from your Adopted Tween. Wednesday, Heather and I invaded the world headquarters of Roundpeg, and had a good chat with Lorraine and Allison Carter about the world of the mom blogger. Joining us was Cami Back, of GetoutMom.com, and it was a great conversation regarding the changing face of motherhood and how the Internet can be a really useful tool for so many different reasons. Check it out at BlogTalk Radio. My review of Judy’s book went up on the Open Adoption Examiner this weekend. If you are in any way involved in open adoption, or know someone who is, please read the review and get Judy’s book for yourself. All of those thoughts, fears and questions you’ve thought about yourself? She addresses them with grace, poise and a positive attitude. Adolesence is going to happen to your kid whether you like it or not, you may as well be prepared! What else happened on the Internet this week? My friend and cohort at Persephone, Selena, wrote a great piece on how not to talk to infertile people. She had to put a few dollars in the swear jar, but it’s a great post, with fantastic comments to continue the conversation. Marcie wrote about not being the mom she wants to be– don’t we all feel that way sometimes? Lori wrote on Gratitude, and it struck me. And it’s striking me now, as I attempt to link this up and the kids are playing “haircut guys.” Mam is combing my hair with a wooden comb she got with a Melissa & Doug vanity set for her birthday, and the Fox is blow drying my hair with an (empty) water shooter. Gratitude, indeed.